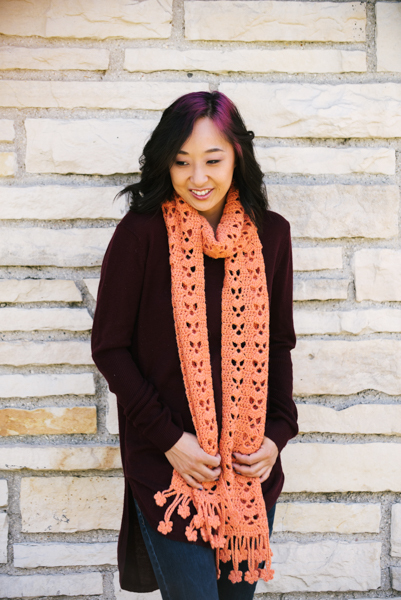 October Blossoms is a worsted-weight scarf featuring an overall lacy stitch pattern and a sweet flower fringe at each end. 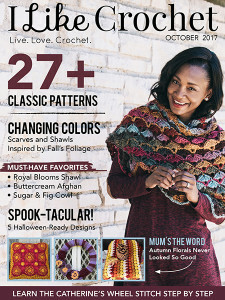 With easy size adjustments, it can also be made into a wrap to toss around your shoulders for those cool autumn days and evenings. Size: Approximately 7¾” wide x 77” long, excluding fringe. Gauge: 18 sts and 9 rows = 4” [10 cm] after steam blocking. Gauge is not crucial to this design. Beg 2-dc cl (beginning 2-double crochet cluster): (Ch 2, dc) in place indicated. Cl (cluster): *Yo, insert hook in place indicated, yo, pull up lp, yo, draw through 2 lps; rep from * once more, yo, draw through remaining 3 lps on hook. 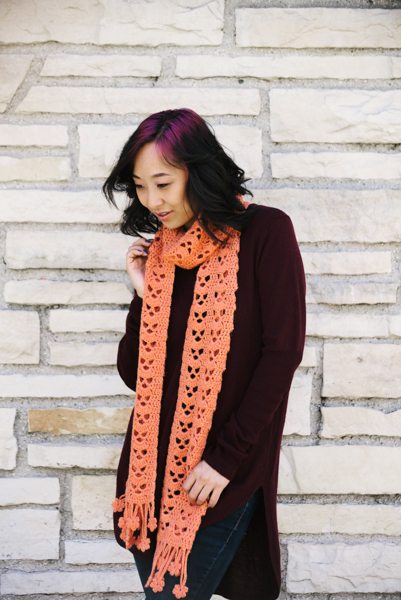 Scarf is worked in two halves from a center Foundation Row out to each end. 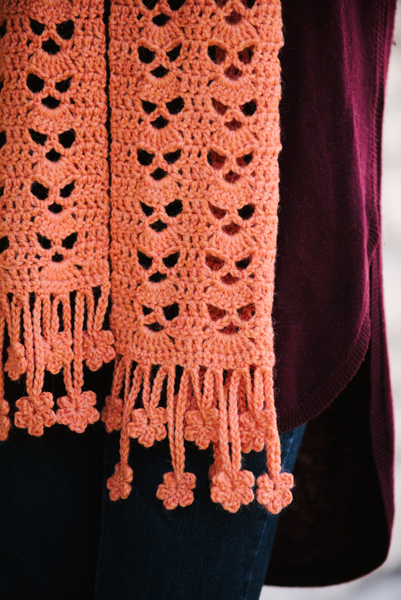 Work stitch pattern over a multiple of 10 sts + 5 to adjust width from a scarf to a wrap. On Row 1 of Second Half of Scarf, when directed to work in base of dc, you will separate the legs at the base of dc and work simultaneously between the legs and over foundation ch. You will also do the same thing when working in the base of the last cl of this row. This will prevent gaping holes in the center back where scarf halves come together. Foundation Row: Ch 35, turn to work on back side under top 2 lps as follows: dc in 3rd ch from hook (last 2 ch + dc count as beg cl), pm in base of dc just made (this is where you will begin second half of scarf), dc in next 2 ch, ch 3, sk next 3 ch, sc in next ch, ch 3, sk next 3 ch, *dc in next 3 ch, ch 3, sk next 3 ch, sc in next ch, ch 3, sk next 3 ch; rep from * across to last 3 ch, dc in next 2 ch, cl in last ch, turn – 2 cl, 10 dc, 6 ch-3 sp, 3 sc. Row 1: Beg cl in first cl, dc in next 2 dc, ch 1, sc in next ch-3 sp, ch 3, sc in next ch-3 sp, ch 1, *dc in next 3 dc, ch 1, sc in next ch-3 sp, ch 3, sc in next ch-3 sp, ch 1; rep from * across to last 3 sts, dc in next 2 dc, cl in last cl, turn – 2 cl, 10 dc, 3 ch-3 sp, 6 ch-1 sp, 6 sc. Row 2: Beg cl in first cl, dc in next 2 dc, sk next ch-1 sp, 7 dc in next ch-3 sp, sk next ch-1 sp, *dc in next 3 dc, sk next ch-1 sp, 7 dc in next ch-3 sp, sk next ch-1 sp; rep from * across to last 3 sts, dc in next 2 dc, cl in last cl, turn – 2 cl, 31 dc. Row 3: Beg cl in first cl, dc in next 2 dc, ch 3, sk next 3 dc, sc in next dc, ch 3, sk next 3 dc, *dc in next 3 dc, ch 3, sk next 3 dc, sc in next dc, ch 3, sk next 3 dc; rep from * across to last 3 sts, dc in next 2 dc, cl in last cl, turn – 2 cl, 10 dc, 6 ch-3 sp, 3 sc. Row 4: Beg cl in first cl, dc in next 2 dc, ch 1, sc in next ch-3 sp, ch 3, sc in next ch-3 sp, ch 1, *dc in next 3 dc, ch 1, sc in next ch-3 sp, ch 3, sc in next ch-3 sp, ch 1; rep from * across to last 3 sts, dc in next 2 dc, cl in last cl, turn – 2 cl, 10 dc, 3 ch-3 sp, 6 ch-1 sp, 6 sc. Row 5: Beg cl in first cl, dc in next 2 dc, sk next ch-1 sp, 7 dc in next ch-3 sp, sk next ch-1 sp, *dc in next 3 dc, sk next ch-1 sp, 7 dc in next ch-3 sp, sk next ch-1 sp; rep from * across to last 3 sts, dc in next 2 dc, cl in last cl, turn – 2 cl, 31 dc. Rows 6-86: Rep Rows 3-5, 27 more times or until length desired before working Flower Fringe. Row 1: Attach yarn with sl st on opposite side of Foundation Row at base of dc where marker was placed, beg cl in same place as sl st, dc in base of next 2 dc, ch 1, sc in next ch-3 sp, ch 3, sc in next ch-3 sp, ch 1, *dc in base of next 3 dc, ch 1, sc in next ch-3 sp, ch 3, sc in next ch-3 sp, ch 1; rep from * across to last 3 sts, dc in base of next 2 dc, cl in base of last cl, turn – 2 cl, 10 dc, 3 ch-3 sp, 6 ch-1 sp, 6 sc. Row 1: Ch 1, sc in st across, turn – 33 sc. Row 2: Ch 1, sc in first sc, *ch 8, turn ch-8 to work on back side in 8th ch, (ch 2, dc, ch 2, sl st in 8th ch) 5 times, ch 7, sk next sc on scarf edge, sc in next sc**, sc in next sc, ch 15, turn to work on back side in 15th ch, (ch 2, dc, ch 2, sl st in 15th ch) 5 times, ch 14, sk next sc on scarf edge, sc in next 2 sc; rep from * across, ending last rep at **. Fasten off – 11 flowers. Spritz with water and steam block to given measurements, opening up lace pattern.